Everyone has a contribution to make just by being themselves, yet at times we all feel like we should be good at something else, something more traditional or socially acceptable. We feel that we should be like everybody else. 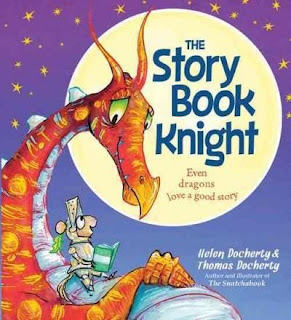 The Story Book Knight (Sourcebooks Jabberwocky, ISBN 9781492638148), a picture book written by Helen Docherty and illustrated by Thomas Docherty, is an elegy to individuals who know who they are. Leo is a knight in a world where knights are supposed to fight, but fighting is not Leo’s style. He likes to make friends and read. His parents, concerned that their son is not fulfilling his potential, find an ad in their “favorite magazine” looking for a dragon tamer and immediately voluntell Leo to embark on a quest to vanquish said dragon. Leo does, but his method of conquest is non-traditional from the outset. Leo finds his own way to navigate the trajectory of a knight and in the end settles into a life that fits his personality. Leo is a story book knight and the illustrations are straight out of a story book. Leo lives in a castle that looks as if it was taken straight out of the English countryside. His parents and the knights that surround him, bear all of the trappings of medieval royalty and nobility. The setting, with its bright green pastoral background, brings to mind a classic fairy tale. The “monsters” Leo encounters are mythic creatures we are all familiar with, but whom we have never seen conquered in quite this way before. Leo is a reader, not a fighter. He defeats and befriends his enemies with his brain, not with violence. Leo’s actions respect his own strengths while illustrating a major theme in the story: that you don’t have to fight in order to win. The Story Book Knight teaches kids to value their own personal strengths as well as the idea that problems can sometimes be solved with intelligence and inventiveness rather than hostility. It also promotes a love of reading by depicting books not only as a means of unifying people, but as a great source enjoyment. My students loved this simple story about a knight in shining armor. Teachers can use this book to teach a number of reading skills, including sequence, author’s purpose, making predictions, and summary.